Burgess wrote thousands of articles for dozens of periodicals – alongside the sixty books, plays, classical music, poetry, film scripts and everything else – and his journalistic writing is a hugely important part of his creative life. As well as being a prolific novelist, Anthony Burgess had a ceaseless energy for writing journalism. Because of a faulty diagnosis of a fatal brain tumour in 1959, Burgess was determined to make a living from writing, and it was clear that being a novelist alone was not the way to do this. Writing in 1984, he says, ‘the rewards of the serious novelist are meagre, and he needs journalism to augment his insufficient earnings from art’. Yet even though Burgess sometimes thought about his journalistic output in this way, the quality of the work he produced indicates that money was not his only consideration. Ever the professional, his writing in reviews and think-pieces remained of a high quality, saturated with the typical wit and invention that are familiar hallmarks of his novels. Moreover, it is primarily through his journalism that the public figure of Burgess is revealed, and it is the voice he perfe cted in these pieces which facilitated his appearances on television and radio. Our website contains an extensive archive of Burgess’s journalism. These examples show the variety of subjects with which Burgess engaged, from James Bond, to Maria Callas, to Umberto Eco. The typescripts show Burgess’s work in progress, with handwritten corrections and the altering of certain words, revealing both Burgess’s professionalism and his eye for detail. 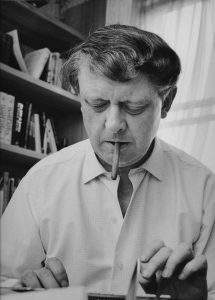 Our growing archive of Anthony Burgess’s own journalism can be accessed here. 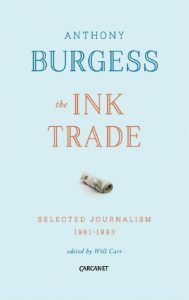 In 2018 a new selection of Anthony Burgess’s journalism was published: The Ink Trade. Alongside literary essays and some stern appraisals of other writers, The Ink Trade contains pieces never before collected, with some never published in English and or never published at all, including: ‘Why I Write’, a lively account of Burgess’s motivations for being a novelist, ‘Joyce as Novelist’, one of Burgess’s most complete and personal statements on his great influence James Joyce, and ‘A Movie That Changed My Life’, on his love for Fritz Lang’s Metropolis and the influence of cinema on his own fiction. It is a fascinating and diverse collection that showcases some of the best of Burgess’s writing. For more details of the book click here. We hope that you are inspired by Burgess’s writing to enter our annual competition in which you could win £3000 for a review of new work in the arts: click here for full details.